pictures with words on them...songs, poems, whatever. I like it. it takes up time. I Want to Hear You Sad by the Early November. I just realized how crappy all these look when transferred to web-hosting. My favorite isn't even up here because it looks bad online. I'll find a way. I'll give it it's own page! lol. I love this song by the way, and the band has the cutest drummer ever. The picture is out the window in Cologne, my beauty. 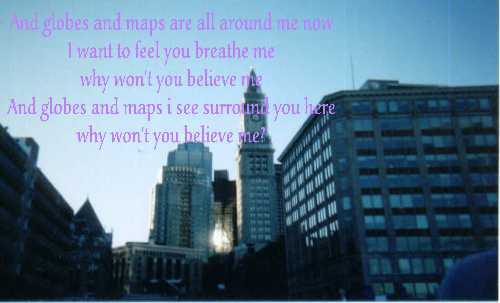 Globes and Maps by Something Corporate. 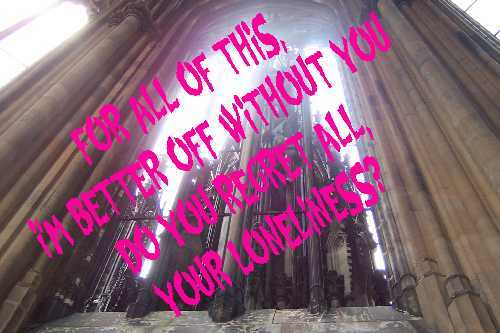 I had this picture and I wanted to do something with it and then the song came and it seemed so perfect. I want to feel you breathe me. It's a view of Boston from the aquarium. SQUEE!!! Joan and Adam kissing from Joan of Arcadia!!! the words are from Breathing by Lifehouse, which seemed to fit the Joan and Adam vibe that day. Even though now Adam is just horrible because of stupid Iris. Down by Something Corporate. Julia asked me to make this one, she picked a picture of the lake that I swam in after going up the Zugspitze in Germany. An Alpine lake. It's gorgeous. Not Alone by Don't Look Down is the song for this one. 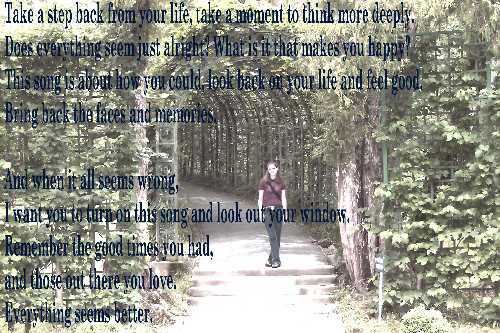 This is a picture of me (crappy I know) in the garden at Linderhof, and the lyrics fit for me in a way because I can look back on this picture and be happy because I was happy that day...for so many reasons, in a place I will never forget. Okay, this is a pic of Orli, and it's from some tv show he was on in the UK, where he was paid to, ehem, you know, and even though the lyrics don't fit for where the picture came from, they fit anyways. 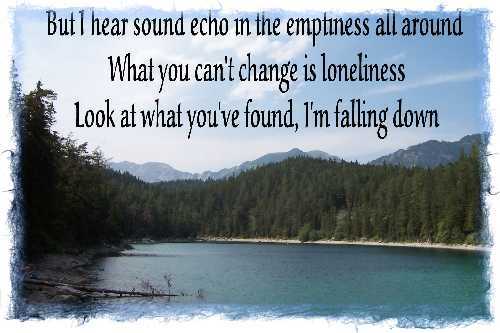 Hands Down by Dashboard Confessional. yum. I had originally cropped this picture for Mike because he thought it was pretty cool, and I added the lyrics from the beginning of Existentialism on Prom Night by Straylight Run. The picture is just a random one I took on a walk we went on through Grosslitgen. It was beautiful. 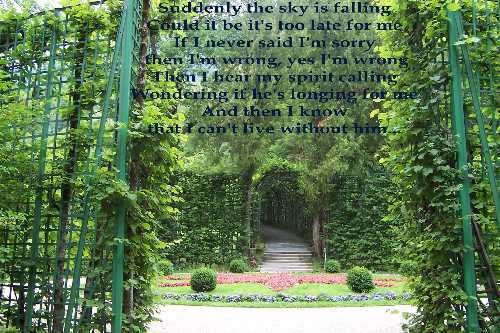 The same garden and place as the earlier picture, but this one is empty, and the lyrics are for someone that makes me think of that day. The song is Save Me by erm, Hanson. Not a good song but good lyrics, I changed the 'she' and the 'her' to he and him, just so you realize they weren't singing about a guy. It is too late for me. Orli. as usual. So cute. Somewhere In Between by Lifehouse. My favorite picture of him is just a little tidbit on this one. This is another one for Julia. You're Gone by Something Corporate, and it's a picture of a statue in Luxembourg, near the Church of Our Lady, but I can't remember who it's supposed to be. Ah well. 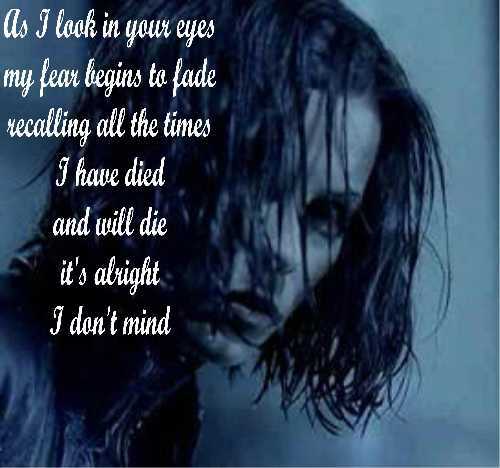 Haunted by Evanescence. Ironically, this is a hallway along the courtyard at the Trier Dom. I like the bulge effect I used on this picture. I remade this one. 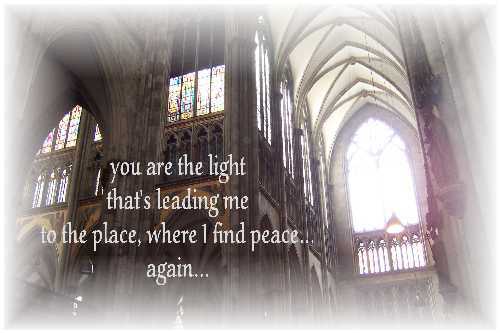 The song Everything by Lifehouse, also a picture inside my beauty, Cologne. 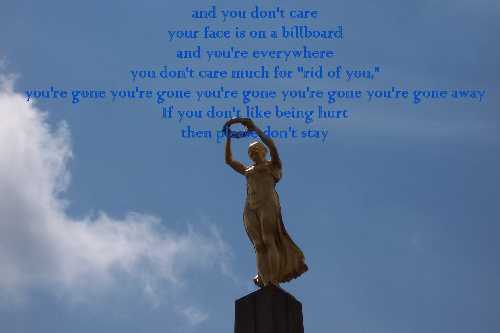 There are so many meanings and feelings for that song it's amazing. It really is everything. Drama Summer by The Starting Line. 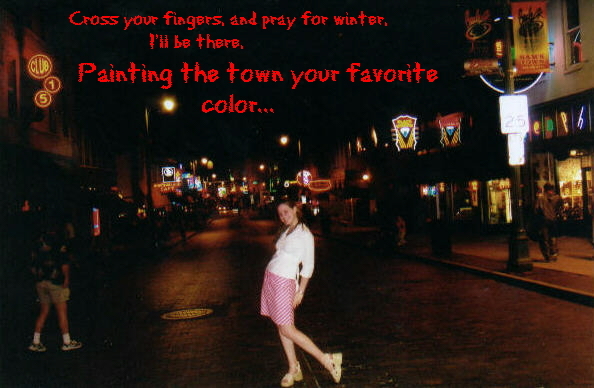 That's me on Beale St. in Memphis, TN. Drama Summer = love. I just love this one, and I can't even really describe why. Three Libras by A Perfect Circle, which is undoubtedly their best song and one of the best songs ever written and recorded. This picture is a painting in the Louvre. 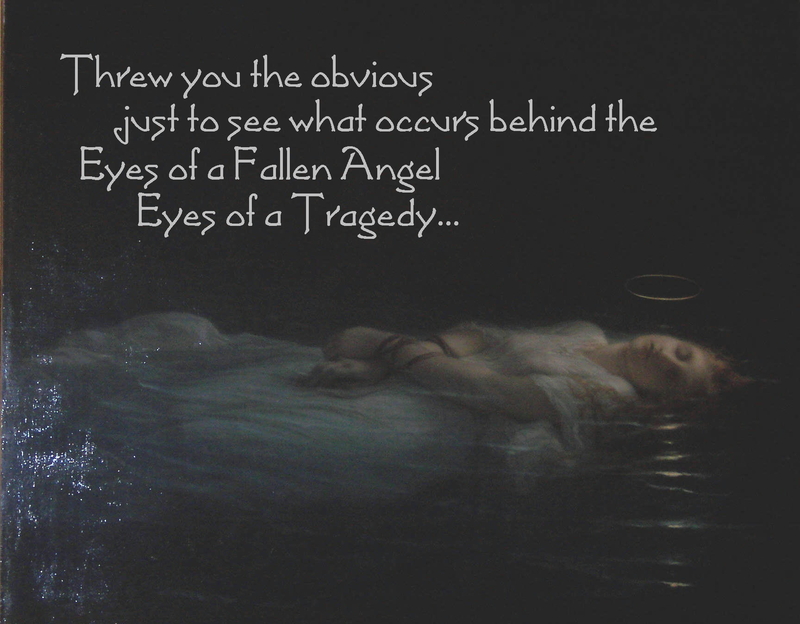 The name and artist escape me now, but it always makes me think of Ophelia in Hamlet, who drowned herself. I think this is my favorite one I've ever made. It just fits in every aspect.